Appropriately called "Marketplace" -- which launched Monday -- the section lets people browse items for sale nearby. Buyers can also search and filter results based on category, price and location. The new feature is located via a tab inside the Facebook (FB) mobile app. Each listing contains basic information about the item on sale, including photos, descriptions and asking price. There's also a counter for the number of times a post has been viewed. Marketplace lets buyers message sellers and make an offer, too -- as well as make arrangements for pick up and payments. Facebook doesn't facilitate the transactions. 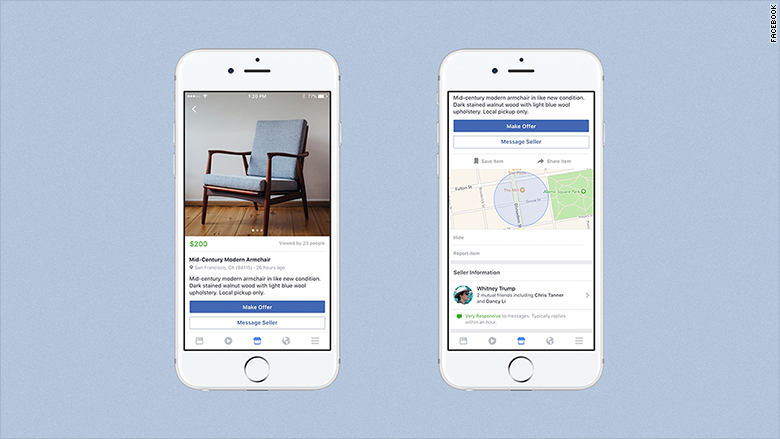 Marketplace is Facebook's take on Craiglist. After a seller posts a listing, it can be shared elsewhere on Facebook. Although anyone over 13 years of age can join Facebook, the Marketplace feature is only be available to users who are over 18. While the feature is new, Facebook users have long been able to buy and sell things through the platform. Many people already create for-sale posts and share them with their friends or inside a group. Now, Marketplace formalizes the process and puts the concept of classifieds in one place. Related: Can Facebook save endangered languages? In some ways, it's a reboot of a similar service Facebook launched in 2007 with the same name. In 2009, Facebook handed over control to classifieds ad network Oodle and eventually the feature disappeared from the site. The new Marketplace is now available in the U.S., U.K., Australia and New Zealand. The company said it will roll out globally soon.